This is something I observe on a daily basis here at Startup Direct. I have observed mentoring sessions and have met with mentees and mentors and am constantly reminded that the shared benefits of a mentee-mentor relationships are outstanding. 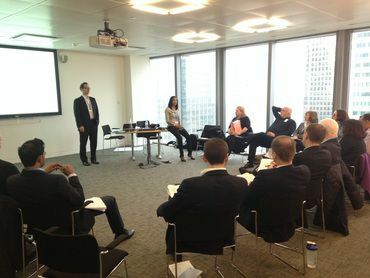 This week I went along to a Mentor training event at Barclays bank organised by Startup Direct. It was run by Lorraine, the mentor manager extraordinaire, and Gregor, a fantastic mentor, with over 20 new, current and previous mentors attending. At the start of the session we discussed the meaning of mentoring in 10 words or less. Starting with the word Greek origins of the word mentor, the group was split up into smaller sub-groups and each group produced a variety of effective adjectives to describe what they do. After much collaboration it was decided that mentoring is “listening to impart knowledgeable support to enable learning and development”. Words such as “independent” and “confidential” were also thrown around and mixed with phrases such as “realise their potential” and “motivating.” The group then talked about the differences between a good a bad mentor. It was decided that the best mentors maintain an “adult-adult” relationship, are “good listeners” and “share skills and knowledge and experience with fellow mentors to enhance skills and competencies”. We tested ourselves to see how good a listener we are using an exercise ­­Gregor introduced and some were surprised, others not, by the results. We discussed the importance of confidentiality, the importance of setting clear objectives from the outset and the importance of clear boundaries and of empathy. The mentors learnt about the various stages of the mentoring process and the importance of keeping Startup Direct updated about the progress of the relationship with their mentees. The mentors I met really care about the success of the businesses they mentor. Overall I the session showed the enthusiasm and knowledge of the volunteer Startup Direct mentors. The mentees they look after are lucky people!